Trees like this Ponderosa pine, with its bark peeled in a specific way, are scattered across the Rocky Mountain region. Cassandra Atencio, a cultural representative for the Southern Ute Indian Tribe, says for tribes like hers, these trees are as important as cliff dwellings or pictographs. “We were little and we were nomadic and we weren't like Pueblos or Navajos,” says Atencio, who oversees the repatriation of artifacts and remains as her tribe’s Native American Graves Protection and Repatriation Act coordinator. “These trees show that we were here,” she says. 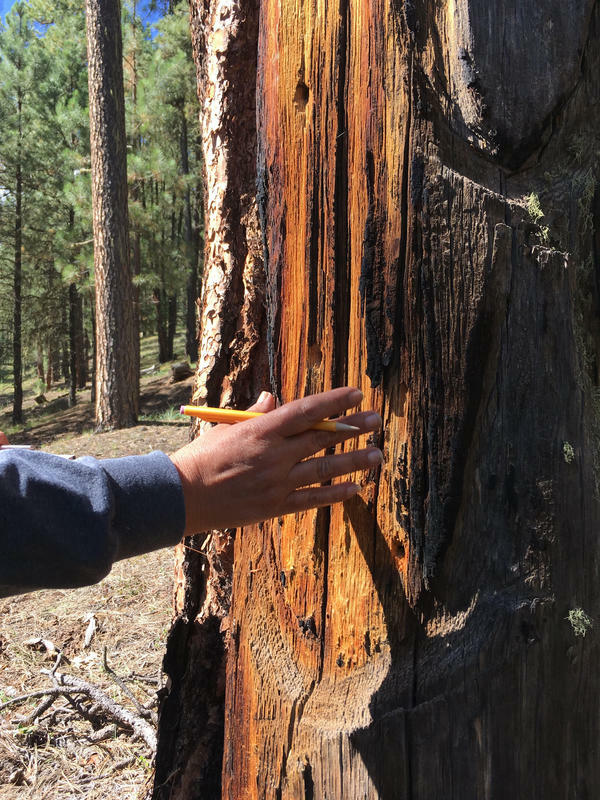 These special Ponderosa pines are scattered across the Rocky Mountains, and they all have something in common: a big chunk of bark missing from one side, peeled away by people sometime in the last few hundred years. “This is real. It places our footprint on the landscape as Ute people -- as a tribe,” says Atencio. On the edge of a meadow south of the San Juan mountains, there’s a bunch of the mystery trees. “That is a humdinger right there,” says archaeologist Mark Mitchell as walks up to a gnarled tree about as wide across as two people. Its thick red bark is curling in to reclaim an exposed area that looks a lot like a telephone pole. “We’re looking at a place where in the past, native peoples have removed the outer bark,” he explains. He says they did it to get to a spongy white material inside called phloem. “Some people describe it as a little astringent. I think it tastes kind of coconutty,” says Mitchell, who is the research director for a nonprofit archaeology organization called the Paleo Cultural Research Group. They teamed up with the Forest Service to study trees like this one. Volunteers start taking measurements and photos. One person starts screwing a hollow pole into the tree, as thin as a drinking straw. The sample will give a date for when the peel happened. There are a lot of questions about these peeled trees. “Yes, there are. One of the biggest questions we have is: What, precisely, was the purpose of the phloem?” he says. “We know it's edible,” says Mitchell. But, he says, were people eating it because it was a delicacy, or because they were starving? Was it medicine? Or was it part of a special occasion? 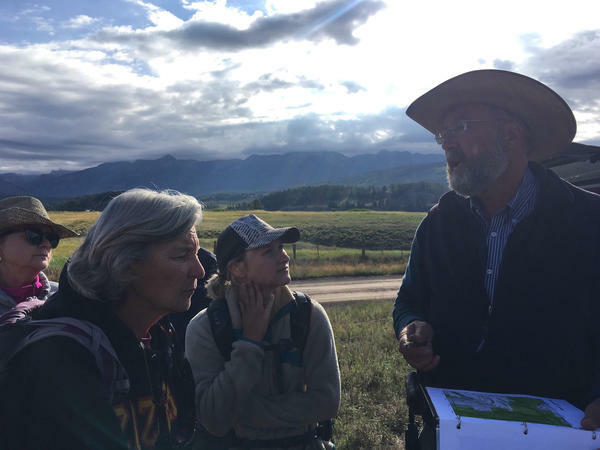 Julie Coleman, an archaeologist with the San Juan National Forest, wonders if these trees could reveal patterns about how tribes like the Ute moved across the landscape. But Mark Mitchell says they’re running out of time to study the peeled trees. “We feel like the clock is ticking now. It's been ticking for a while, but we really feel the urgency of it now,” he says. Logging felled many of the trees in the recent past. Now, a number of things threaten them. Drought could kill these trees. An expanding beetle infestation could cripple them with a fungus called blue stain. Or, wildfires could erase them. “Some of the big fires that we've had in Colorado in the last five or six years have taken some of these trees. We know that,” he says. But time could also get them. Some of these trees could be 500 or 600 years old, like this one. “Oh wow, that is cool,” says one volunteer, peering at the trunk of a hundred-foot-tall tree with a special pattern carved into one side. “That is neat. That is amazing. I was hoping we’d find one of these,” says Mitchell, as others gather around. For this tree, people didn’t just scrape off the edible part. They also pried off six planks of wood, presumably to build something like a traditional cradleboard to carry a baby in. That’s what it reminded Cassandra Atencio of. Seeing it brought her to tears. Just a couple years ago, she made a cradleboard for her grandson. “And I wanted to do his cradleboard old-school,” she says, with willow and Ponderosa wood. She’d wanted to peel a Ponderosa plank for the backboard but didn’t know how. But here was an example, right in front of her.